We are looking forward to working with GMR Group after they selected Hermes Logistics Technologies (HLT) to implement its Cargo Management Systems at Hyderabad International Airport (HYD), India. We signed a five-year contract with GMR Group’s subsidiary GMR Hyderabad International Airport Ltd (GHIAL), including an upgrade schedule that ensures Hyderabad Airport’s cargo terminal will operate with the most sophisticated Cargo Management Systems available. HLT rose to the challenge of implementing the cargo management system in under 60 days from signing the contract, and the entire process was finished with two days to spare. It has been a pleasure to work with GMR Group who are highly professional and committed their best people to work with us on this project, which was extremely helpful and enabled us to meet the implementation deadline. Welcoming GMR Group to our portfolio of international clients is another example of how HLT continues to expand globally, and we look forward to working with them further. GHIAL-owned and operated Hyderabad International Airport (HYD) is the sixth largest international airport in India. 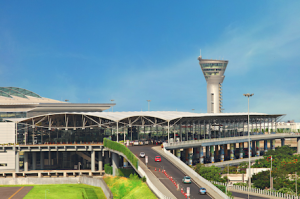 GHIAL is part of the New Delhi-headquartered GMR Group which specialises in the infrastructure sector with projects across India and around the world, including airports, energy, transportation, and urban infrastructure. “We selected Hermes Logistics Technologies for our Cargo Management Systems at Hyderabad International Airport because we need state-of-the-art, reliable software to ensure the smooth handling of cargo,” said SGK Kishore, Chief Executive Officer, GHIAL.